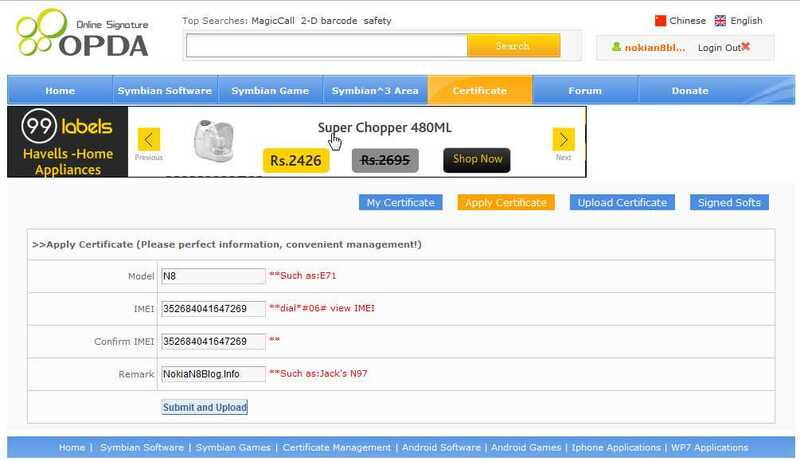 Nokia N8 Blog: How to generate symbian certificates for signing apps? How to generate symbian certificates for signing apps? This specific post refers to the process for acquiring the Symbian certificates for your Nokia devices whether running on Symbian Anna or Symbian Belle or an earlier S60 version. All you need is the IMEI number of your phone. You need to dial *#06# on your Nokia handset to get the IMEI number. 3. Login with the new account. 4. Click on Apply Certificate and key in the details. 5. After submitting the IMEI in the previous step, go to My Certificates. The process outlined above may not be effective after sometime when the website finds about this loophole and changes the process. However, even in the worst case scenario, you can get these certificates by paying 3 Euros and the best part is that the certificate files get generated immediately as soon as you submit your IMEI.